This Hussh Competition Promotion is offered subject to the terms and conditions set out below "Terms and Conditions". Entry is only available to residents of Australia who are aged 21 years or older. 3.Entrants must complete the online entry form and fill in all required fields. 4.The promotion ends at 5.00pm on Tuesday 26th February, 2019. 5.The Winner is drawn on Tuesday 26th February, 2019. Return flights for two people from winner's closest capital city to Melbourne’s Tullamarine airport. Both passengers must be coming from the same airport. Town car service from Melbourne airport to the warehouse sale event on Friday 1 March, 2019. Town car service from the sale event to the accommodation. Town car service from the hotel to Melbourne airport on departure on Sunday 3 March, 2019. 2 nights shared accommodation (one twin room) in 5-star Melbourne CBD hotel. A $200 voucher for each person (Entrant and entrant’s companion) to spend at the Homewares warehouse sale event valid only during the three day event. The voucher is not transferable. 1. There is one Travel & Shopping Package to be won over the period of the competition. 2. The total Travel & Shopping Package prize value is approximately $3,500 (AUD). 3. The Travel & Shopping Package is offered by Ayr Ventures Pty Ltd trading us Hussh (“Hussh”). 4. The Travel & Shopping Package is available for use only by Australian residents over the age of 21. 5. The Travel & Shopping Package cannot be redeemed or exchanged for any other form of travel or shopping services. 6. This is a single-use Travel & Shopping Package. Any un-used portion of the Package is forfeited and is not redeemable for cash or other forms of credit. 7. Notification and claiming the Prize. Following the Prize draw, the winner will be notified using the contact details provided by the Entrant. The winning Entrant has 24 hours from the time and date of the notification being sent to respond, provide proof of eligibility and claim the Prize. If the Prize is not claimed by the winning Entrant within this time frame, the Prize will be redrawn and any previous winners will forgo all claims to the Prize. 8. The Travel & Shopping Package is only valid for travel from 01/03/19 – 3/03/2019 while the Homewares sale event is on. Travel must be concluded by the Expiry Date. 9. The Redemption Date for the Travel & Shopping Package is 27/02/19. The Travel & Shopping Package must be booked no later than this date or the Travel & Shopping Package prize is forfeited in full. 10. Once the Prize is booked by Hussh, no changes to the booked travel plans can be made. Changes or Cancellation may incur charges from Airlines, Hotels or other Suppliers. 11. If the Entrant or the Entrant’s companion fails to board the booked flights for what ever reason the Entrant or the Entrant’s companion is responsible to pay any charges associated with missed flights and The Travel and Shopping package cannot be applied to any additional costs associated with changes or cancellations to the original booking requested by the Entrant or the Entrant’s companion. 12. There is no residual value and no credit will be issued if the booking amount is less than the Travel & Shopping Package amount. 13. The 'Prize' does not include transfers from your origin to the airport. The Entrant and the Entrant’s companion are required to make their own way to the airport. 14. The "Prize" does not include incidentals at the airport or accommodation. Both the Entrant and the Entrant’s companion will need to supply ID at the accommodation and for the flight and either the winner or the companion will be required to supply the hotel with a valid credit card to cover incidentals and damage. 15. 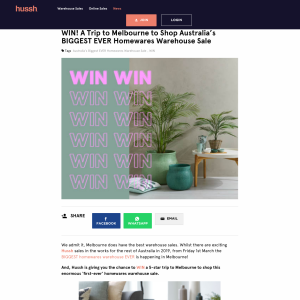 The 'Prize" does not cover any activities other than one visit to the Homewares warehouse sale in Truganina on Friday 1 March, 2019. 17. All taxes, fees, charges and surcharges applicable to the booking, including, without limitation, extra person, phone, parking and other charges are applicable to your reservation, and this Travel Package cannot be applied to them. These charges must be paid at the time the reservation is confirmed or to the hotel property directly and are the responsibility solely of the winner or the winner's companion. 18. The Travel & Shopping Package cannot be applied to any costs or miscellaneous fees charged by the Hotel or Airline and incurred by the customer. 19. Terms and conditions of this offer are as written and cannot be changed by any representation of any unauthorised person, including employees of Hussh. 20. Travel & Shopping Package is void where prohibited or restricted by law. 21. If you have any questions about the Travel & Shopping Package, please email us at info@hussh.com.au. 22. Proof of age and residency may be required to claim the prize and is at the discretion of Hussh. 23. Hussh reserves the right to change these terms and conditions without notice and at any stage during the promotion. 24. Other Terms and Conditions Prize Winners must comply with all the normal terms and conditions connected with the website Hussh.com.au. See https://hussh.com.au/terms-conditions/ for full details. 25. The winner is picked at random. If the winner is from Victoria then the Prize is valid without the return flights and airport transfers. 1. Nothing in these Terms and Conditions limit, exclude or modify or purports to limit, exclude or modify the statutory consumer guarantees as provided under the Competition and Consumer Act, as well as any other implied warranties under the ASIC Act or similar consumer protection laws in the State and Territories of Australia (“Non-Excludable Guarantees”) and New Zealand. Except for any liability that cannot by law be excluded, including the Non-Excludable Guarantees, Hussh (including its respective officers, employees and agents) excludes all liability (including negligence), for any personal injury; or any loss or damage (including loss of opportunity); whether direct, indirect, special or consequential, arising in any way out of the promotion. 2. Except for any liability that cannot by law be excluded, including the Non-Excludable Guarantees, Hussh (including its respective officers, employees and agents) is not responsible for and excludes all liability (including negligence), for any personal injury; or any loss or damage (including loss of opportunity); whether direct, indirect, special or consequential, arising in any way out of: (a) any technical difficulties or equipment malfunction (whether or not under Hussh's control); (b) any theft, unauthorised access or third party interference; (c) any entry or prize claim that is late, lost, altered, damaged or misdirected (whether or not after their receipt by Hussh) due to any reason beyond the reasonable control of Hussh; (d) any variation in prize value to that stated in these Terms and Conditions; (e) any tax liability incurred by a winner or entrant; or (f) use of a prize. 3. Hussh collects claimants’/entrants’ personal information in order to conduct the promotion. If the information requested is not provided, the claimant/entrant may not be able to participate in the promotion. Hussh will not disclose this information to anyone other than contractors who provide services to Hussh for the purposes of conducting this promotion unless compelled or permitted by law. Entrants’ personal information may be disclosed to State and Territory lottery departments and winners’ names published as required under the relevant lottery legislation.